The disposal of unwanted empty pallets remains a significant challenge for some businesses as their back rooms, garbage bins or storage areas fill up with the empty or broken platforms. There are several reasons why pallets accumulate, including small quantities, poor quality, unusual sizes, or local market dynamics. If the damaged or unwanted pallets are from internal operations, think about switching to a more durable pallet that will last longer, and require less repair and replacement. Typically, the cost per use decreases dramatically as you invest in a better quality pallet, be it a heavy duty wood pallet, or a highly durable alternative material pallet. Ask the shipper to pick up the empty pallets, either directly or through a third-party retrieval provider, or have the shipper use a pallet rental company like CHEP or PECO. Pallet retrieval, offered by a wide range of pallet companies, can be a win-win for the product shipper as well as the receiver, resulting in the receiver clearing the pallets off of the receiving dock, and providing the shipper with a lower cost per trip through reuse. Ask the shipper to use standard sized pallets such as GMA style 48x40” units that will be more attractive to others for pick up, because they have value to other pallet buyers. Arrange with a local pallet recycler to pick up the pallets. Depending on the size and condition, the recycler may pay you to acquire certain desirable pallets or charge a fee if they are not a popular size or of suitable quality. 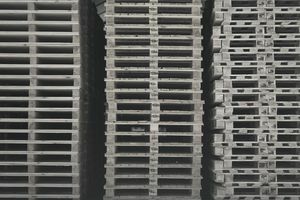 Once you establish a pattern of accumulation, pallet recyclers typically will work with you to provide a regular removal service. Have the shipper switch to corrugated paper pallets which are easy to recycle with other cardboard. This approach has been adopted by IKEA to eliminate their empty pallet logistics challenges. According to sources, they now generate over 10 million cardboard pallet shipments annually. Sticking with the corrugated paper theme, the shipper could switch to slip sheets. With slip sheets, no new pallets are entering your building. Instead, the receiver uses push-pull or clamping attachments to reposition unit loads onto your internal pallets. Such an approach is used successfully for certain product categories such as tissue and breakfast cereal where maximum cube space is desired. Advertise on Craigslist or other methods to hobbyists, if pallets are fairly clean and unweathered. Wood pallets are extremely popular for craft projects. Be mindful, however, of risk issues surrounding members of the public entering your location, or the labor and oversight that will be required to ensure public safety on your premises. It may prove to be more prudent to pay to have a pallet or wood recycler remove the pallets than manage hobbyists coming onto your premises. Think about pallet ‘flow through’ as an option. If you need pallets for your internal operations as well as for shipping, encourage the shipper to utilize higher quality pallets that after emptied, can be utilized in-house and for shipping. Typically, this involves the receiver sharing the cost of the pallet with the shipper, who would otherwise be paying the total amount for a more inexpensive pallet. Flowthrough can be an excellent strategy for gradually acquiring a pool of higher quality pallets while having the shipper participate in achieving this objective. An old, but a not recommended approach, is to position old pallets or unwanted wood crate material on the outside of your fence along with a sign which indicates "free pallets and firewood." Besides being an eyesore, it may pose other risks such as increasing the possibility of arson.